The Samsung SmartThings has got a dedicated app control to sync its Hub to its various multipurpose sensors and also to control third-party devices by pairing them. Through the SmartThings app, you can perform several actions like managing light colors, setting up security checks, activate your door/window sensors, operate your locks, setup schedules and a lot more. Let us look at some of the main features to understand the main functionality of the SmartThings App. 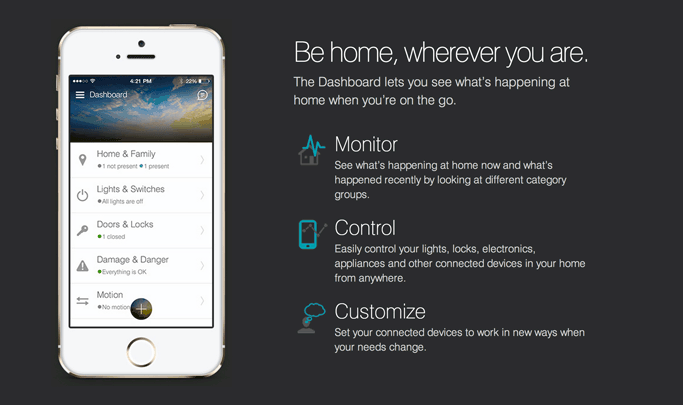 The five main areas of the the SmartThings app include Dashboard, My Home, Notifications, Routines and MarketPlace. At the app Dashboard, you can get a quick top-level view of the current status of your home. Directly from the Dashboard itself, you can get the access to your Smart Home Monitor that lets you know whether your home is safe from any hazards or intrusion. The Dashboard panel will give you a direct access to various controls for Doors and Locks, lights and switches, Home and Family, Damage and Danger etc. However, the Things section has now moved under the My Home location. Take a look at the video below to get a better idea about how to start with the SmartThings App Dashboard. Within the My Home section, you get a lot many customisation options. Name your location and you will be able to group your smart devices in the physical rooms of your home. This grouping feature gives you a better control to organize your device in your rooms. Also you can select the “featured device” you would want to prominently appear on the top of the screen for each room. this featured device would be the most important and most frequently featured device offering users excellent control capabilities to dim or brighten up lights, access camera feeds for live footage, lock and unlock the doors, adjust the thermostat and much more. Under My Home, you can see the list of all Things connected with their current status, and the list of all SmartApps you have installed. If you have your individual family members connected, you can get a summary of who is at home. Routines will help you personalise how your smart home works by customising different actions that you want to automatically happen like when you go to sleep, wake up, leave for the work or return home. You can even create new routines that suit your lifestyle. the Notifications section of the SmartThings App work in two parts. The Messages will provide you summary of all the actions that SmartThings have taken upon your request and other notifications and alerts that you have asked to receive. On the other hand, the activity list will run list of all the events from your other connected things like the temperature, motions, lights turning on and off etc. This is the section that demonstrates the list of all the Things (including third-party) that are compatible with the SmartThings. In also includes the section os SmartApps developed by the developers of the community and the SmartThings team. The Smart Home Monitor is an integrated home monitoring solution which allows the SmartThings to sends text messages/notifications to users in case of unwanted activities like intruder motion, fire and leaks or any other important activity. Through a connected camera to the Smart Home Monitor, users can get short video clips of all the unexpected events that occur. The Smart Home Monitor gives users the choice to perform actions they would want to in case of an intruder breaking in. An intrusion alert can be triggered by various simultaneous actions like recording the video clip, turning on the lights, ringing the alarm siren, sending a notification etc. As the name suggest, this is a simple tool used to configure and customise how you want your smart lights to function. Based on the events like sunrise and sunset, your working schedules you can automate your lightings.